Alanna of Trebond, the sole woman knight in the realm of Tortall, splashed happily in the waters of an oasis, enjoying her first bath in three days. Hard to believe that it’s winter in the North, she reflected. In the Southern Desert the temperatures were just right, although she objected to so much sand. Alanna stepped out of the water, grabbing her clothes. She had no urge to meet any Bazhir tribesmen, particularly not renegades. She and Coram were bound for Tyra in the south, and coming to battle with the warlike desert men would cut their journey very short. Drying off, the young knight pulled on a boy’s blue shirt and breeches. Although her femininity was not the secret it had been when she trained in the royal palace, Alanna still preferred the freedom of men’s clothing. It was odd to remember that the last time she bathed in an oasis, she had been a page and Prince Jonathan had just found out she was a girl. Those days—the days in which she bound her chest flat and never went swimming—were gone. She didn’t miss them. 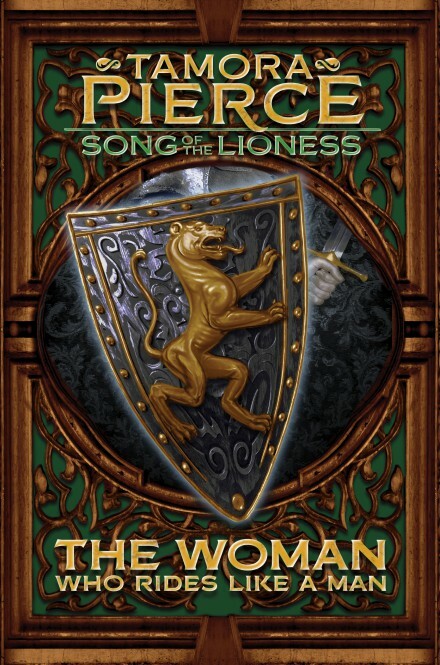 Grabbing her sword, Alanna raced for Coram and the horses. An approaching cloud of dust indicated tribesmen or robbers, and she grimaced as she threw herself into Moonlight’s saddle. She trotted forward to meet Faithful, a small black streak racing toward her across the sand. The cat leaped, landing squarely in front of his mistress before climbing into the leather cup that was his position on her saddle. Alanna’s gentle mare held steady, used to the cat’s abrupt comings and goings. “Let’s try to reach the road!” Alanna told Coram. Alanna shook her head stubbornly. She could see their pursuers now: they were hillmen, the worst of the desert raiders. Reaching behind her, she unbuckled her shield from its straps, slipping it over her left arm. Coram was following suit. Alanna nodded. The Bazhir were deadly fighters, but they had a strict code of honor. Hillmen lived for killing and loot. Alanna charged directly at the hillmen. Coram gulped and followed her, letting out a war cry. Moonlight reared as they reached the first raiders, striking out with hooves: she had been trained for battle years ago. Alanna slashed about her with Lightning, ignoring her enemies’ yells of fury. A one-eyed villain closed in, grabbing her sword arm. With an angry yowl Faithful leaped from his cup with his claws unsheathed. The one-eyed hillman screamed and released Alanna, trying to pull the hissing cat away from his face. “Lass! Beware!” Coram bellowed, trying to fend off three at once. He yelled in pain as one of them opened a deep gash on his sword arm. He swore and attacked again, dropping his shield and switching his sword to his good left hand. Warned by her companion, Alanna whirled to face a giant hillman, a grinning mountain with red hair and long braided mustaches. He guided his shaggy pony with his knees, leaving his hands free to grip the hilt of a sword with an odd crystal blade. Alanna eyed its razor-sharp length and gulped, ducking beneath the redheaded man’s first swing. He reversed it, and she blocked it with her shield just in time, yelping at the pain of impact. She struck back with Lightning, only to miss as her attacker darted away. She refused to follow and fight on his terms. 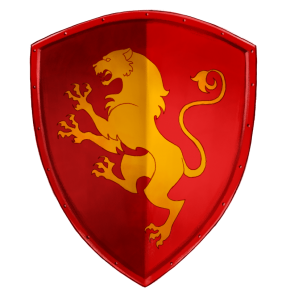 Instead she brought her lioness shield up and waited. The giant returned, circling her carefully. His pony lunged forward, and Moonlight reared, warning it back with her flailing hooves. Alanna caught another blow from the crystal blade on her shield, feeling the shock through her entire body. I hope my brother put plenty of magic on this shield, she thought grimly. Otherwise it won’t last through its first battle! She turned Moonlight as the giant circled her on his nimble pony. With a kick of her heels she urged the gold mare forward, slashing at her opponent. She was a knight of Tortall, and not to be toyed with! She used every chance to break through his guard. He blocked her time after time, grinning infuriatingly. Alanna drew back, breathing hard and fighting to keep her control. Now the giant returned the attack, and she blinked sweat from her eyes: She could not afford to make a mistake now! His tactics were different from those of the mounted knights she had fought before; she didn’t know what to expect. Suddenly the midday sun was directly in her eyes—he had maneuvered her just for this. Only at the last second did she glimpse his sword descending on her. She brought Lightning up hard, slamming her blade hilt-to-hilt with the giant’s sword. There was a ring of clashing metal, and the downward sweep of the crystal edge was stopped. Then Lightning broke, sheared off near the hilt. Moonlight darted away, taking Alanna out of the hillman’s range. Her mistress stared at the hilt she still gripped. Lightning had been her sword ever since she had been considered fit to carry one. How could she fight without it in her hand? Coming out of her daze, Alanna fumbled for her axe. She was trembling with rage; it took all her self-control to keep from losing her temper completely and making a fatal mistake. Axe in hand, she charged the hillman with a yell. She didn’t hear the warning cries of the other hillmen, or Coram’s gleeful whoop; she heard only the wheezing of the giant’s pony and her own choked breath. She swung, swearing as the hillman ducked and pulled out of her range. She was closing with him again when he yelled, seeing something behind her. To her fury, he whirled his pony and fled, calling to the few men he had left. Alanna spurred after him. “Come back, coward!” she cried. The giant turned to laugh and shake his sword at her. His voice was choked off as a black arrow sprouted in his chest. More arrows struck down the hillmen; only two escaped. They rode for all they were worth, pursued by five white-robed tribesmen. A Bazhir, his white burnoose tied with a scarlet cord, rode toward Alanna as she dismounted. She was staring at the body of the hillman who had wielded the crystal sword. The blade lay beside him, gleaming against the sand. It glimmered and suddenly flashed, blinding her for a short moment. Alanna stared: against the yellow-orange fire that filled her sight was a picture. A dark finger—or was it a pole?—pointed at a crystal-blue sky. Before it stood a man wearing tattered gray; his eyes were mad. She could smell wood smoke. Her eyes cleared, and the vision was gone. Reaching under her shirt, Alanna drew forth the token given to her by the Great Mother Goddess three years before. It had once been a coal in her campfire; now it was covered in clear stone, its fires still flickering under its surface. Alanna knew that if she held it when magic was present, she could see power as a glowing force in the air. She saw magic now as orange light flickered around the sword, and she scowled. Recently she had dealt with magic of this particular shade, and the memory was not pleasant.